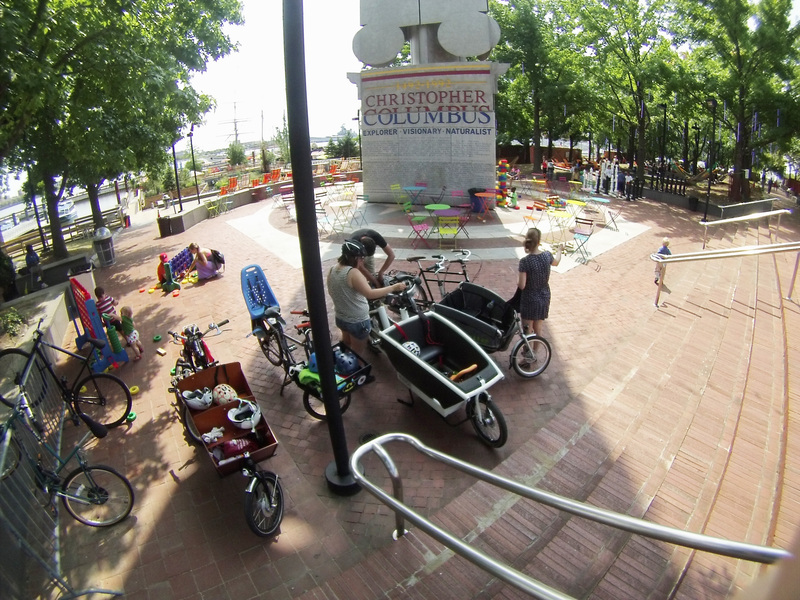 This Saturday, August 30, 2014, Kidical Mass Philadelphia will ride from Fitler Square to Spruce Street Harbor Park. We will meet at Fitler Square, starting around 10:30 AM. We will chat safety rules and fill out waivers and then roll out at 11:00 AM. We will take the Pine Street buffered bike lane all the way to Front Street, where we will take a left. When we get to Spruce Street, we are going to make a right up onto the sidewalk, dismount from our bikes, and walk to the park. There are cobblestones on Spruce Street so we will avoid any mishaps and make sure all of our riders make it to the park in one piece! It’s a 2.1 mile ride in total. If you need a bike, call Transport Cycles or Fairmount Bicycles to see what they have! Both shops rent cargo bikes! If you are driving to the starting spot, you can easily get back on to Spruce Street (with buffered bike lane once you get past the cobblestones at Dock Street). -All children must be accompanied by an adult that is responsible for their riding and behavior during the ride. –Training wheels are not recommended due to street conditions. Independent kid riders are great: make sure they know road safety basics and are ready to listen closely and obey the rules of the road. -Dena and Marni will lead the route. -When we encounter vehicles blocking the bike lane (and we will! ), we will “take the lane” to go around, when it is safe to do so. -In general, we will not block intersections to go through red lights (“corking“): if our group gets split up, the front pack will stop and wait. On rare occasions, we may cork a street if there is no traffic coming or a car has offered to stop. -There is one bike rack that is not designed to fit anything except road bikes. Please bring locks so that you can sufficiently lock your wheels and bikes to each other. We will create our own bike locking area. -There are food and beer available but you can also bring outside food in. -There are a few tables but not many places to sit on blankets. -There is a fountain that kids are allowed to wade into. We recommend bringing a change of clothes/towel. Thank you to the Bike Coalition of Greater Philadelphia for their support! This entry was posted in activities, bicycle coalition of greater philadelphia, bicycling, biking, cycling, free, kids, kids activities, philadelphia, summer, Uncategorized and tagged babboe, babies, bicycle, bicycle coalition, bicycle coalition of greater philadelphia, bicycles, bicycling, bike lane, bikephl, bikes, biking, biking with kids, cargo bike, cargo biking, children, cycling, event, kidical mass, kids activities, outdoors, philadelphia, philadelphia kidical mass, philly kidical mass, summer, summer activities, transport cycle. Bookmark the permalink.